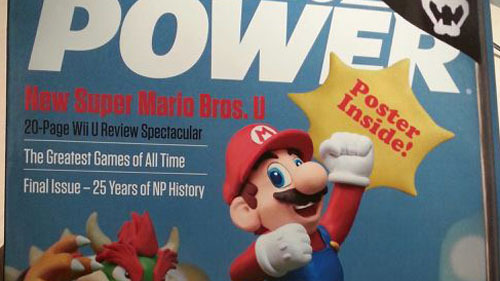 Last month the final issue of Nintendo Power was released. I was hesitant to pick up a copy due to low funds during the holiday season, but nostalgia pulled me in and I couldn’t be happier! Back in the day I think I’d started with issue two, and this issue brings back a lot of fond memories, as well as making some new ones. So what is in store in this issue? From it’s throw back cover that references the first Nintendo Power issue with a clay scene from the latest Mario game, to the touching “Game Over: Thanks For Playing” image on the last page, the final issue is a class act all the way. Poll results and charts start off the issue in letters and NP’s “Greatest Games of All Time” section. The greatest games is a wonderful list that looks back at 285 games that the NP staff decided on from Nintendo systems. Following that, a wonderful look back at the magazines history tells the tale year by year of some memorable issues. Power Players brings past and present editors of NP together to share their memories. Then the book goes into the latest Wii U titles, reviewing Nintendo’s new games which I’m sure will be a wonderful time capsule for where the magazine wraps up. The most touching part I found was one last Nester comic for Nintendo Power that tells the tale of Nester’s son Max giving his perspective on the end of the magazine’s run. This is definitely a collectors item that brings back tons of nostalgia for Nintendo Power fans. I picked up mine at the electronics section of my local Walmart. Odds are you can hopefully still snag a copy there too! Thanks Nintendo Power and all the best to all of you in the future! It’s great that fans get one last group of reviews, straight from the pros!